I am Harley’s Grandad Doug, I have done many self organised walks for many different charities, Harley has joined me on a couple. I never imagined I would be doing them in memory of my 21 year old fit and healthy grandson taken from us this without warning in January 2016. 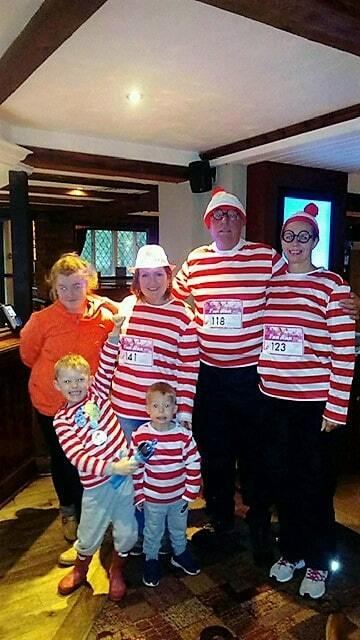 One of the walks I did with a few friends was dressed as Where’s Wally, those friends and that outfit became our tribute to Harley every time we took part in a walk for him. On Sunday 23rd September 2018 I did one in the pouring rain, with Harleys mum Michelle Bourne, our friend Susan Wiles and her three grandchildren Tegan, Freddie & Harry. I led off as I was doing 10k and Sue the children 5k, they did amazingly, particularly given the weather. Michelle then came back to find me and finish with me. My wife Freda was there as our support, being unable to do long walks she held the fort waiting for us at the end with hot drinks and a warm welcome.